While U.S. attention is focused on the Toyota recall debacle, India is wondering why Tata Nanos are bursting into flames. So far at least four $2,500 Nanos have caught on fire. The three previous fires were caused by a faulty switch placed near the steering wheel. Tata has ordered an investigation to find the culprit for the newest barbecued Nano. Tata Motors has publicly stated that the fire was an isolated incident and is considering adding another round of quality control checks for the Nano. 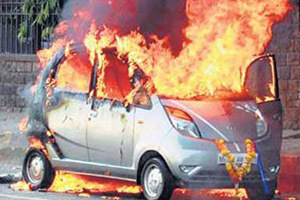 Satish Sawant, an insurance broker and owner of the cooked Nano, did not notice his car was on fire. “I have no idea what happened. A motorcycle rider overtook me and told me that the vehicle was on fire. The engine was behind me and I did not realize that the car was on fire,” he said. Ratan Tata’s dream of a 100,000 rupee car has had its share of problems since its inception. Tata’s plan to build a plant to produce the Nano in Singur, West Bengal was met with violent protests. Local farmers disapproved of their land being acquired by the company. Also the cost to produce the Nano has risen considerably since production began. According to Motor Authority, material costs have risen 13 to 23 percent since the car begin development in 2003. In the future, Tata Motors will be forced to raise the price or sell the Nano at zero profit or even a loss. The fire stories might hurt sales if the Nano ever reaches the European and American markets. Tata Motors hopes to sell the redesigned Nano Europa for €5,000. The Europa will feature a more powerful engine and a stronger body that conforms to strict European crash regulations. There have even been rumors of a €10,000 electric Nano for the European market. A Nano hitting U.S. shores is years off, but Tata Motors needs to further improve build quality. If a sticking gas pedal will scare buyers away, a vehicular bonfire will have them running. Tata Motors cannot afford any negative perceptions about build quality when it enters the US market.